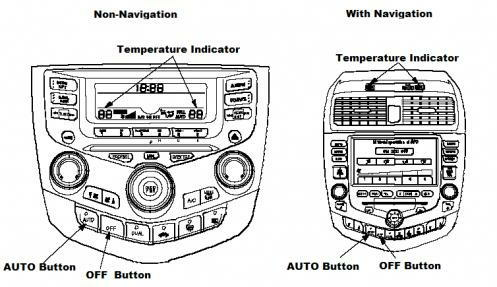 This is the information from an 03-06 Accord Shop Manual I found online. 2. Press the AUTO button and then the OFF button. Continue to hold buttons down for 1 minute. If there are any problems in the system, the temperature indicator will light up the segment (A through Q) corresponding to the error. The temperature indicator will then alternate every second between the displaying "88" (all segments lit) and the error code segment (A through Q). NOTE: The system will only display the DTC when the AUTO and OFF buttons are pressed. If you release the buttons, the display will go blank. To return the display, simply press the AUTO then the OFF buttons again. This is the procedure for 03-07 Accords without climate control. 2. Turn fan switch OFF. 3. Set temperature control dial to Max Cool, then push the mode control button to select Vent. 4. Turn the ignition switch ON (II). 5. Press and hold down the recirculation control button. 6. While holding the button down, press the rear window defogger five times within 10 seconds. The recirculation indicator blinks two times, then the self diagnostic will begin. If there is any problem in the system after self-diagnostic is finished, the recirculation indicator will blink Diagnostic Trouble Code (DTC) 1 through 6. 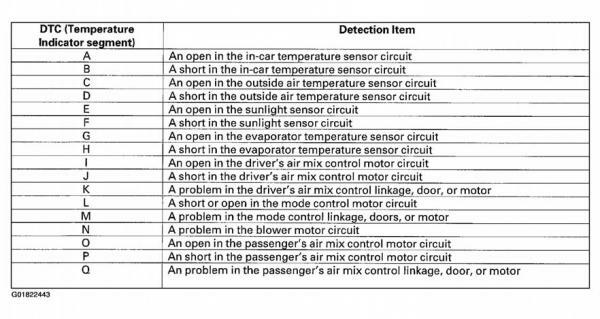 If there are any problems in the evaporator temperature sensor circuit, the A/C indicator will blink DTC 7 or 8. If no DTC's are found, the indicator will not blink.